Custom painted and laser etched 20 oz. 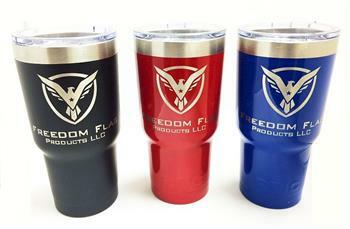 RTIC made tumbler, great for everyday use. Keeps ice for 24 hours and hot liquids for 6 hours. A must have when on the go! Features: 20oz. RTIC Tumblers are stainless steel, double wall vacuum insulated. Keeps Ice Longer - Holds ice for up to 24 hours. Also keeps it beverages hot longer. No Sweat Exterior - The outside stays dry. No need for a coaster. 18/8 Stainless Steel - Strong stainless steel construction. Easy Grip Base - Taller base ensures a better grip. The crystal clear lid lets you know exactly how much drink you have. Easy to clean. Rough riding in the boat, off-roading in your truck, ATV or in the field; the sliding closure resists spills and is straw friendly. Colors available are Vivid Black, Bright Red, or Patriot Blue! Copyright © 2019 Freedom Flag Products. All Rights Reserved.